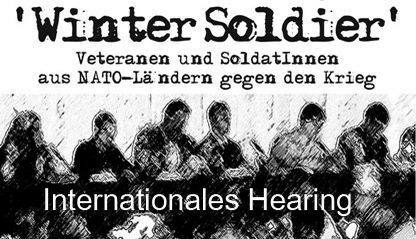 I too am proud to be here today and to participate and to contribute in some small way to the first IVAW Winter Soldier-Europe. During the Civil War it was called, Soldier’s Heart; Shell Shock in WWI and Battle Fatigue in WWII and in the 1970’s, Vietnam syndrome. Today we call it Post-traumatic Stress Disorder. Although the names have changed throughout history, the emotional damage that comes from the violence of war clearly has not. It is the result of subjecting human beings to situations that are anything but human. Chris Hedges wrote, " Each generation responds to war as innocents. Each generation discovers its own disillusionment, often at a terrible personal price." PTSD in combat soldiers usually differs from that of the general population in a couple of important ways. 1) While combat soldiers are victims they are aggressors as well. They suffer because of what has been done to them but also because of what they have done to others. 2) Individuals who develop PTSD identify a precipitating event; the trauma, and for most in the general population this means a single, isolated, event. For combat soldiers however, especially those engaged in wars of insurgency like in Iraq and Afghanistan, the precipitating event is anything but singular or isolated. Rather it is one long, protracted trauma that lasts for fifteen months, the length of combat tour. Symptoms of PTSD include: 1) re-experiencing the trauma through flashbacks or bad dreams 2) avoidance of stimuli associated with the experience or numbing of general responsiveness including detachment from others, diminished interest in activities, or inability to experience emotion/love; and 3) persistent symptoms of increased arousal including insomnia, anger outbursts, and exaggerated startle response. One in five soldiers or about 300,000, returning from Afghanistan and Iraq suffer from PTSD and or depression and it is estimated that there will be 20,000 new cases for every year the war continues. Active duty soldiers are unlikely to be diagnosed with PTSD. In fact they are more likely to be punished for their symptoms than they are to receive the treatment they need. Self-cutting , anger outbursts, and alcohol abuse, among others are symptoms conveniently labeled misconduct by the military resulting in disciplinary action. In other cases soldiers are given diagnoses such as personality disorder indicating that the symptoms come from a pre-existing condition and are not attributable to combat experience. Those who do receive a diagnosis of PTSD are heavily medicated and returned to active duty. Severity of PTSD symptoms increases with the number of times a soldier is redeployed and for many this can be two, three, four or even five times. When PTSD goes untreated especially if the trauma is severe, as it is in combat soldiers, individuals often develop additional symptoms: panic attacks, alcohol and drug abuse, depression and suicidal are common. Around 30% of returning soldiers abuse alcohol and other drugs. Unable to get adequate treatment or reluctant because of the stigma attached to PTSD by the military, they often drink and/or abuse drugs to aleviate their symptoms. Neglect of our soldiers is also sadly reflected in suicide attempts and suicides. Suicides and self-inflicted wounds in the Army are up six fold since the beginning of the Iraq war. In 2007 there were 2,100 soldiers who injured themselves or attempted suicide compared with 305 in 2002. In 2008, there were 143 suicides reported, an all time high, and in January 2009, there were a reported 24 suicides, more than the number of soldiers killed in Iraq and Afghanistan during the same period.. The exact number of suicides is unknown because those occurring more than six months after discharge are not included in statistics. To end, I’d like to read a quote from Howard Zinn, the American historian and activist. I think his words reflect the the spirit of Winter Soldier. "Civil disobedience is not our problem. Our problem is civil obedience. Our problem is that huge numbers of people all over the world have obeyed the dictates of the leaders of their government and have gone to war and millions have been killed because of this obedience. Our problem is that people are obedient all over the world in the face of poverty and starvation and stupidity and war and cruelty. Our problem is that people are obedient while jails are full of petty thieves and all the while the grand thieves are running the country. That’s our problem."